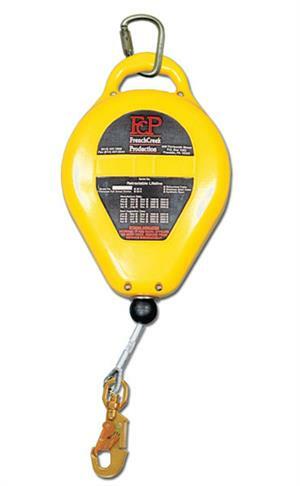 Retractable lifelines provide extreme durability with high mobility! These units offer an extended range of movement, zero slack to eliminate tripping hazards, and a centrifugal braking system that engages at the slightest of falls! Super-strong cast aluminum housing featuring a dual internal inertia braking system, internal deceleration braking system, swivel impact indicating snap hook, #354-4 carabiner for anchoring, and choice of lifeline material. FCP's self-retracting lifelines are engineered to provide extreme durability, reliability, and performance necessary in any work environment. In the event of a fall, FCP's SRL's are designed to lock up within 24", reducing impact forces on your body. We also continually recertify our mechanical units, providing a tremendously long service life. Why choose FCP's SRL's? 50' of galvanized wire rope. Working Length - 50 ft.
Work Load Cap. - 310 lbs. Total Weight - 20 lbs.